Though you probably associate letter boards with church services and old movie theaters, they've quickly become a mainstay of home decor. From witty quotes to grocery lists to save the dates, these quirky, vintage-inspired boards are versatile and simple to customize. 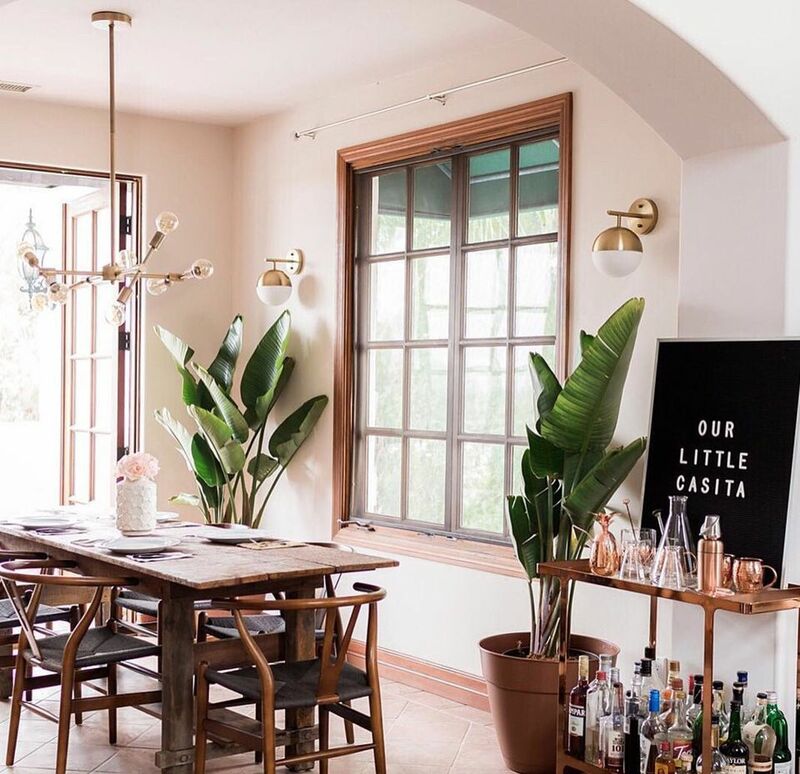 Even if you have no artistic ability, you can create a delightfully cute letter board to hang on your gallery wall or set atop your home bar, as seen in this gorgeous dining room from letterfolk. If you want to bring this creative idea to your home or next party, there are countless ways to use letter boards. Here, we've rounded up some of our favorite examples. You don't have to be a poet to customize a letter board. This funny quote board from Love & Renovations makes a big statement on a gallery wall. The simplicity of a black-and-white marquee allows it to work with any layout and home decor style. You can find endless quote ideas on Instagram or Pinterest, or be creative and come up with your own! Looking for unique holiday decor that's a little out of the ordinary? This fun letter board from House of Hawthornes is a great way to welcome guests to your next New Year's Eve party. Recreate this idea on Thanksgiving, Christmas or a loved one's birthday. The real beauty of a letter board is its versatility. Mimic this shot from thebelmontranch for a fun, lighthearted way to send far-away family and friends a pregnancy update (and give your new baby the boot!). Letter boards are a favorite among photographers for everything from school photos to wedding shots, and adding a cheeky statement like this one is a fun way to get creative in family pictures. Though most letter boards are made from felt or plastic and have a traditional black-and-white block letter look, this embroidery hoop from My Sister's Suitcase is a great twist on the idea. Whether you're looking for an easy DIY for your nursery or guest room, this creative letter board can be crafted in just an hour. Some of our favorite settings for letter boards are parties and weddings. This Cinco de Mayo bash from Giggles Galore uses a felt board to decorate a table and encourage guests to get their party on. Use a letter board simply as art or as signage to describe drinks, food or the events of the night. This wooden marquee letter board DIY from Five Marigolds is a modern twist on the standard vintage letter board. Made with particle board and adhesive vinyl letters, this approach is utterly hip and will definitely stand out in your home. If you love Scandinavian style, this neutral wooden board from the_happy_door is a modern, minimalist alternative to the vintage-inspired letter board. We love the felt flowers that surround the wood board, giving it a fresh look perfect for a sunny kitchen or den. Just add a cheeky quote, and voilà. This stunning welcome sign for an anniversary party was spotted on Green Wedding Shoes, and it's one of the most photogenic uses of a letter board we've seen. Its vintage simplicity works well with the rustic, artsy party vibe. Whether it's for a birthday, anniversary or wedding, a letter board is a great way to show your appreciation for your guests upon arrival. Always forget to buy eggs? A letter board is an attractive way to give yourself reminders or keep a grocery list in the kitchen. We love this felt letter board from The Sorry Girls, which can be easily DIY'd and looks great in a kitchen. This adorable photo from yuritootie is another cute way to share your pregnancy with friends and family. Throughout your nine-month journey, use a letter board to mark your baby's progress. If you're looking for an alternative approach, this unique peg board idea from designletters is a fun spin on the traditional style. This peg board is a great idea for a contemporary or modern home decor look, either indoors or out. This large letter board from trebventure is a great way to motivate yourself first thing in the morning. There are endless letter board ideas with inspiring quotes and sayings, all offering a hip upgrade from store-bought quote decor. We love this "grow girl" sign from brookandpeony (intentional typo and all). Add a cute letter board to your indoor greenery arrangement or even place one outside next to your garden. Plus, who couldn't use another reminder to water the plants? This mini letter board from blissstudiopdx can be placed nearly anywhere in your house, but we love it on a coffee or espresso bar. A small letter board is a great way to take your breakfast bar or cocktail bar cart to the next level. Here's an idea that's both beautiful and functional. Blogger Nesting With Grace enlisted her children for some DIY letter board creation, giving them a fun activity that's also educational. A felt letter board is a great toy for children; let them use their imagination to create words and sentences, then display in a den or toy room. We all have a quote or song lyric that really speaks to us. This letter board from Jennifer Rizzo features a Stevie Wonder quote, and is beautiful way to give yourself a lovely reminder every time you walk in the door. Instagrammer treeringstudios inspires us to use letter boards in all of our family photos. This adorable "baby's first Christmas" shot uses a letter board to commemorate the big day in a subtle, chic way. We love this Mother's Day idea from leafcubes_felt_letter_boards. With so many online print stores, it's incredibly easy to use a letter board to create your own personalized greetings and set the stage for a photo mom will cherish forever.